One must be careful in making condemnations of contemporary culture and claims regarding the degradation of society and romanticizing the past. There is no dearth of criticism regarding the "malling" of New York City and the invasion of big box retailers into the NYC marketplace. And certainly many of the criticisms are valid. At first glance, when looking at this magnificent Beaux Arts building at 632 Avenue of the Americas, my first reaction was how inappropriate it was that this building would house Bed, Bath and Beyond, Filene's Basement, and TJ Maxx. 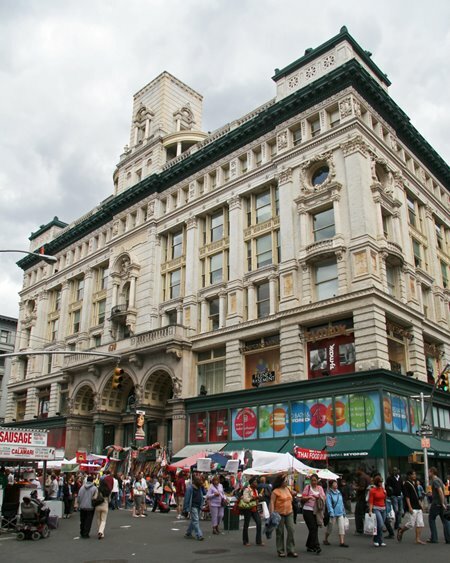 A little research will reveal that this stretch of 6th Avenue (from 18th to 23 Street), replete with enormous architecturally wonderful buildings, was once known as the Ladies' Mile and that the beautiful structures lining this avenue were originally built as department stores. The most opulent was the Siegel-Cooper, originally designed by DeLemos & Cordes and built in 1896 as a discount department store for Siegel, Cooper & Co who were based in Chicago. The New York store became a mecca for shoppers. There was a fountain in the center of the lobby which became a meeting place in New York. Jets of water cascaded over multicolored lights onto a marble and brass statue of The Republic.